Path To U.S.-Iran Deal, Prisoner Swap Began Years Ago While negotiations over a nuclear deal between the United States and Iran began two years ago, smaller efforts for diplomacy go back to the last decade. Iranian President Hassan Rouhani presents the draft budget for the next Iranian fiscal year to the chairman of the Iranian Parliament Ali Larijani at the Iranian parliament in Tehran on Jan. 17, 2016. Iran is open for business again as ten years of punishing international sanctions are lifted. 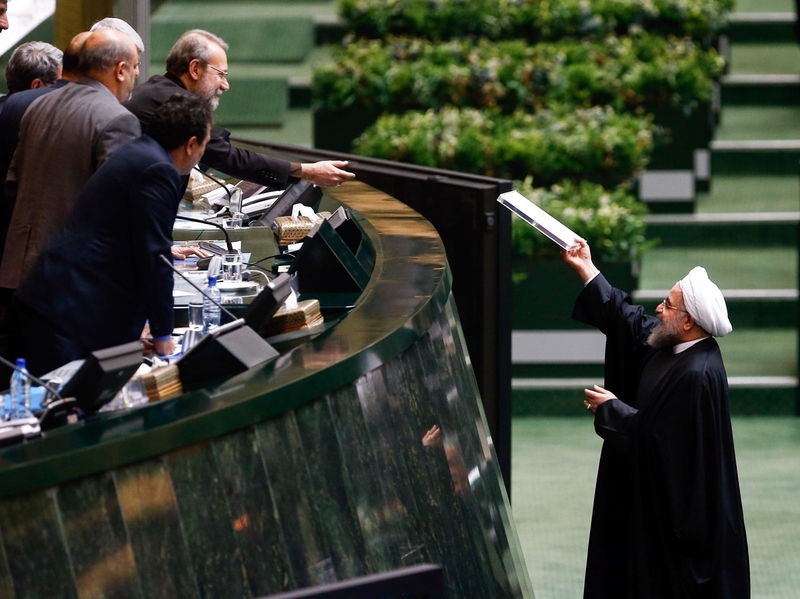 President Hassan Rouhani declared the nuclear deal a "golden page" in Iran's history as he presented a new budget to parliament on Sunday. Economists call it the biggest windfall in history, with as much as an estimated $150 billion of Iran's frozen assets being unlocked from banks across the globe. "Implementation Day" was declared in Vienna on Saturday. The U.N.'s nuclear watchdog, the IAEA, certified Iran had fulfilled its obligations under a nuclear agreement with six world powers. "This will turn Iran from the most sanctioned state to the country with the most monitored nuclear program in the world," says Ali Vaez, a senior Iran analyst with the International Crisis Group. It's the "Big Bang," he says. The agreement opens a way for Iran to transform its economy and reconnect its 80 million people to the global economy. "After more than a decade, the race of sanctions against centrifuges, has finally ended," he says. The new era began with signals that the nuclear deal represents a change in relations between Tehran, the international community, and the United States. Especially striking - a prisoner swap that came hours before the main event in Vienna. Five Americans were released, including Washington Post journalist Jason Rezaian, held for more than a year on charges of spying. The U.S. granted clemency and released seven Iranians accused of violating U.S. sanction laws. "This is a major victory for diplomacy, a victory for people who want to talk to Iran," says Mohsen Milani, who heads the Center for Strategic Studies at the University of South Florida. While nuclear negotiations are also an example of "talking to Iran," it is an extremely technical agreement between diplomats and experts. 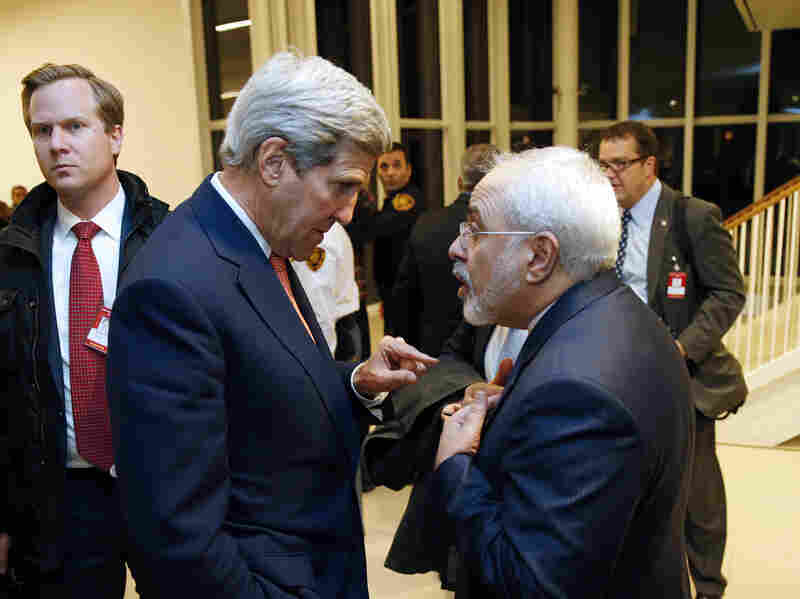 U.S. Secretary of State John Kerry (left) speaks with Iranian Foreign Minister Mohammad Javad Zarif after the IAEA verified that Iran has met all conditions under the nuclear deal. "Iranians put cement in a nuclear reactor," says Milani, about a crucial step in the nuclear agreement when the core of the Arak heavy water nuclear reactor was removed and disabled. "Ordinary Americans and Iranians don't understand what that means," he says. In December, Iran shipped out 25,000 pounds of low-enriched uranium and dismantled more than 12,000 centrifuges, also part of the deal. "Iran has undertaken significant steps that many people – and I do mean many – doubted would ever come to pass," Secretary of State John Kerry said in remarks in Vienna. But it was the release of five Americans held in Iran that captured American attention and overshadowed the landmark conclusions of the nuclear agreement. This was a tangible example of the new era, coupled with the quick release of captured U.S. sailors in the Persian Gulf last week. "You are talking about actual people, not centrifuges," says Milani about the emotional reactions. It also demonstrated a change in Iran. "For me, it shows there are reasonable forces who don't want to go back to the bad old days," he says. Secret negotiations over Americans held in Iran began more than "14 months ago and accelerated after the conclusion of the nuclear deal," according to senior officials who briefed reporters after the swap was announced on Saturday. As the names reverberated on social media and TV news channels on Saturday, the swap was widely applauded in the U.S. despite charges by Republican presidential hopefuls that it showed the latest American "weakness." "In terms of optics, it's more powerful than 'Implementation Day,'" says Milani, in what appears to be a historic shift that has "opened the door of communications," after more than three decades of enmity. For the Obama administration, the prisoner swap and Iran's swift compliance with the deal's difficult measures is the triumph of diplomacy and dialogue over confrontation and public threats. Still, the opening to Iran is a gamble that historians will debate for years, citing key moments and motivations that led to successful negotiations. The deal took two years of formal negotiations between Iran and six powers, but the Obama administration reportedly reached out much earlier. The Wall Street Journal reported discreet exchanges that go back to 2009. President Obama sent another signal the same year. He was the first U.S. president to call the country "The Islamic Republic of Iran" in a Persian New Year's message to the Iranian people. Iranian President Hassan Rouhani speaks during a press conference on Jan. 17, 2016 after international sanctions on Iran were lifted. Soon after, the U.S. and Iran opened secret back-channel communications facilitated by the tiny Gulf state of Oman. "A convergence of factors explains it," says Emile Hokayem, a senior fellow at the International Institute for Strategic Studies. Based in the Gulf, he says the Obama administration saw Iran as a potential breakthrough as the aftermath of the Arab Spring convulsed the Arab world. "With Iran, there was an opportunity for a deal. Iran looked cohesive, it has institutions," even though Iran's regional policies were often at odds with U.S. goals, he says. "Iran was bad, but it was good at being bad. Iran is a competent actor." 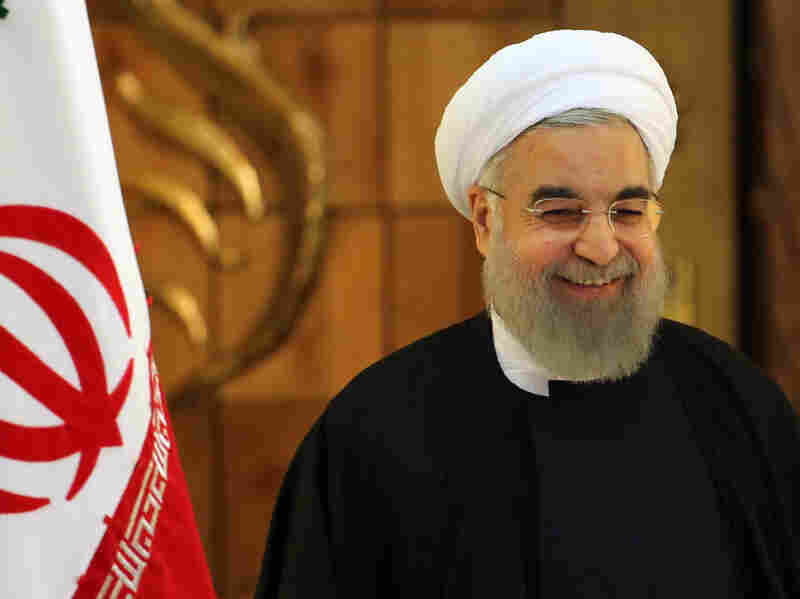 When President Hassan Rouhani took office in 2013, the White House called his election "an opportunity" for Tehran to resolve international concerns over its nuclear program. During his campaign, the moderate cleric pledged to open a new chapter with the West. More important for his country's crippled economy, Rouhani promised to reintegrate Iran into the international economic system after decades of isolation. It was a high stakes gamble, linking the success of his presidency to success in complex nuclear talks with world powers. Both presidents faced domestic pressure to scuttle the deal. For the Obama administration, the opening to Iran was met with deep suspicion by congressional Republicans. Republican presidential hopefuls pledged to scrap it on the first day in office. America's key allies in the Middle East, Israel and Saudi Arabia, are adamant that Iran is a destabilizing force likely to grow bolder with a huge injection of cash as sanctions are lifted. The objections are likely to grow louder as implementation gets underway, says Hokayem. "Iran remains a very concerning actor, very confrontational. There is a long list of U.S. interests where Iran cannot be a net contributor." In a sign of the tumult of the new era, on Sunday, the U.S. Treasury announced new sanctions against 11 entities and individuals involved in procurement on behalf of Iran's ballistic missile program. "There will be ups and downs in relations," says Milani. "You cannot change years of animosity and political war between two countries overnight."